A good bakery is a wonderous thing. You’ll quite often find me, nose pressed against the glass, eyeballs widened, and probably just the hint of drool coming from the side of my mouth. I don’t usually go in, I don’t need to. I like just looking. Seeing what’s on offer, how they have presented different things, and getting ideas for my own baking efforts. Many moons ago, I lived for awhile in Germany. Twice a week I would head off, cold crisp air on my cheeks. Hands wedged into pockets and music wedged into ears, I would set forth on my two buses to get to a German language class. I loved this time. I loved the German winter, I loved the alone time, I loved being in a different country, I loved learning the language… and I really loved stopping off at a bakery afterwards. Germany bakeries are a thing of wonderous beauty. So many different types of wonderful breads, and enough sweet goodies for a young Australian gal to do more than a little drooling. Everything I ever ate was delicious. Really delicious. Sure I probably headed for the same kind of things time and time again, but when you are on to a good thing, why stop eh? So what did I go for? Anthing vaguely fruity/ sour related. Cherry strudel? You betcha. Plum struesel? Yes indeed. They all had my name well and truly written all over them. So with a German bakery in mind, Plum Shortcakes it was. Fruity, not crazy sweet, but enough of sugar kick just to say … ja bitte, das ist lecker. 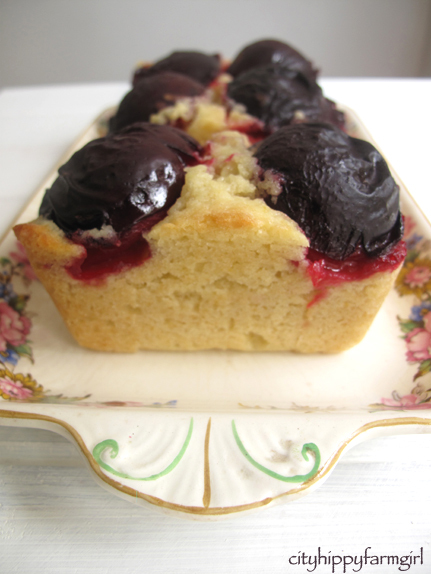 This entry was posted in Food Glorious Food and tagged afternoon tea, butter, dessert, easy desserts, plum, seasonal, short cakes, simple, small cakes, sweet by cityhippyfarmgirl. Bookmark the permalink. It certainly was Celia, I loved it over there. As for the plums they have been lovely to cook with. 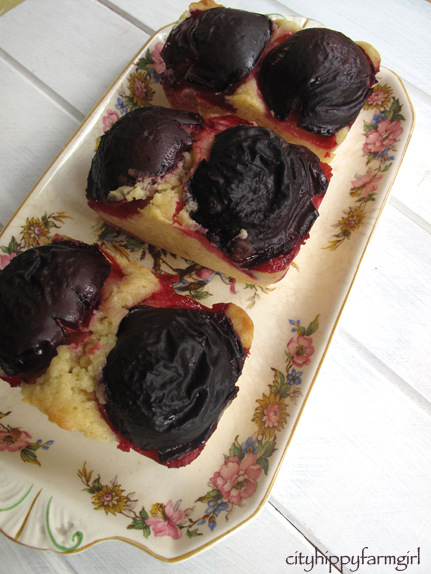 Thanks Brydie, I echo Celia, the plums are so good this year this is a perfect recipe. let me know if you make it Rose. I like it when the juice seeps too Jane. I just had a ‘seepy’ crumble made with a whole heap of plums. OH YUM – they look divine! I’ve got a friend coming to lunch on Saturday so I think I’ll attempt these for dessert. (Can you please give me a teensy bit more guidance re approximate cooking times? I’d hate to burn them! And should I use fresh plums or would preserved plums work? Thanks so much Brydie). Thanks Brydie – you’re always so helpful : ) I’ll let you know how they turn out. I’ve got little individual (round) pie tins so I thought I’d use them. I’ll be happy if they look half as good as yours! Those are just darling as we’d say over here! I come to city hippy farmgirl for my dose of nose on the glass, bakery dreaming. They look gorgeous, if only I could smell them! Unfortunately I’ve forgotten the majority of what I’ve learnt… besides asking if you slept well- which isn’t particularly helpful. So I cut them up and steamed them. When I found this particular recipe, I knew these would work well instead of the whole fruit. Just the right amount of fruity/tart/sweet. Yum! p.s. has something changed here, coz I’m having to log in to wordpress to leave my comment? Very odd. Annoyingly yes regarding the comments. I’ve put an explanation up in my side bar. I’m hoping they will change it back?? Shall we line up together and leave drool marks Johanna? Oh. I want some. Or one. I want one. No fresh plums right now. I wonder if I were to try some stewed prunes? No- I’ll wait for some plums. No wait for the plums Heidi, if you think about them all that time waiting for the season to come around, just imagine how good they will taste! Your bakery window gazing sounds rather like my picture gazing when you post images and recipes like these…except I would definitely enter and make a purchase if only the computer screen would allow me 🙂 These are beautiful looking shortcakes. Thanks Kari, that’s really kind. 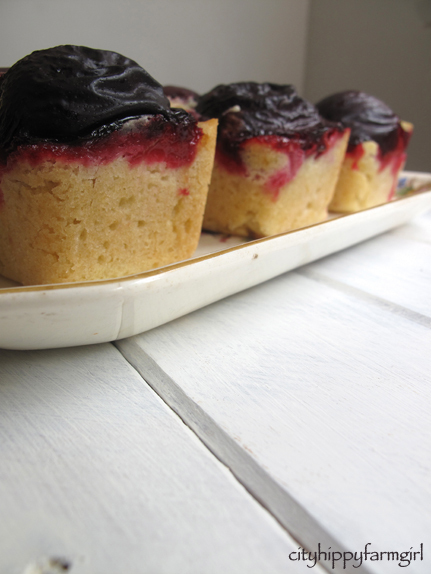 These look fabulous and just the thing for this weekends baking as my tree if dripping plums. Those German bakeries are a sight to behold! We were once deep in the vast emptiness of Namibia and we came upon a tiny town with the biggest German bakery I’ve ever seen. There were 32 huge cakes and the cafe part was full of people. I think the whole population of that town was there eating cake! It’s funny, I’ve heard there are some amazing Germany bakeries in Namibia. Not the first place you would normally think of for awesome German food! They are wonderful aren’t they Tandy… a good one that is… And think of all the wonderful ones you will be visiting in Italia. Oh wow – they look fantastic. Love that they have so much plum per slice. That’s a good PPS ratio you have going on. 🙂 PPS is always important! Firstly, I can’t believe all the blogging you’ve done with a brand new little bub. How wonderful to see you resume doing the things you like? As I sit here marveling at your ability to cope with two small children and a newborn, I’m reminded of myself. When I brought home my third bub, Nicole, it was to a garage actually as we were building the house. It could of been worse as in baby no two’s case – we brought him home to a leaky caravan. What a nightmare! I digress. The point I wanted to make was that here I had become a mother for the third time and off I went teaching myself how to sew. I was addicted. I figured I would make things small for the kids and if they didn’t work out, then it wouldn’t matter because I won’t have used much fabric. Well they did work out and off I went. I was a total lunatic; all this work, not enough sleep, trying to cook and clean in the garage all the while sewing every spare second I could. It was wonderful. What a time. I’m enjoying thinking about it. I’m sure you’re savouring every moment in life too. I wanted to see if the comment would work before going on. Secondly, you lived in Germany? Wow. Where? My mother came from Dusseldorf and Mitchell’s best friend lives in Stuttgart. When I went there three years ago, it was simply breathtaking. I loved Germany and spent no where near enough time there. Mitch said Heidelberg was stunning and he loved Bavaria and all the Black Forest region. And I thoroughly agree: the bakeries there are amazing. I took photos of the famous German Plum Cake. Do you recall seeing them in the shops over there – massive round baking tins – one cake would take up half the space in one window. They were enormous. So fascinating. Thirdly, I made something very similar to your recipe today. Instead of plums, I used canned cherries. I also grated an apple and whipped together a vanilla buttercake mixture. Together with some warm home made custard, it was the perfect afternoon tea on this rainy, almost wintry day on the gold coast. All I can say is, great minds think alike. Trust me Mariana, there is a good degree of utter chaos with the 3! Blogging is good as I can still do it one handed, two fingered typing style although at a much slower pace than what I was doing. Yes I often wonder why things that work often have to be fixed!!! MMM,..what a superb creation! I thnik I would add a bit of cinnamon or a plum liqeur to it!